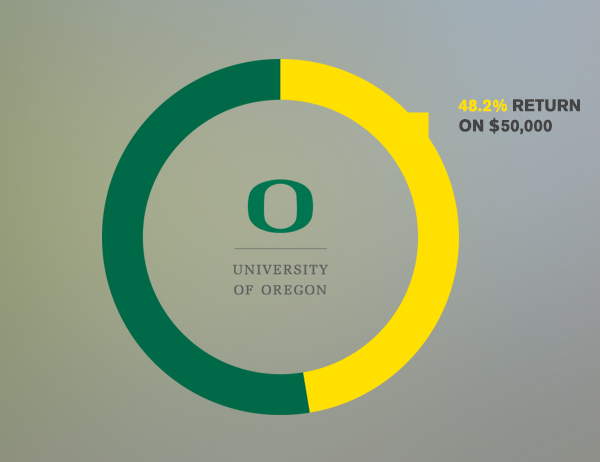 Returns in excess of 48 percent (you read that right) put the portfolio managed by the University of Oregon Investment Group (UOIG) well ahead of those of 19 other schools participating in the D.A. Davidson & Company (DADCO) Student Investment Program for the 2012-13 school year. During the same period, the UOIG portfolio handily beat the S&P 500 index's 16.1 percent return and the 13.1 percent gain of the Dow Jones Industrial Average. The DADCO fund, which focuses on small cap stocks, is one of three differently structured portfolios managed by UOIG that total approximately $1 million in live money. UOIG's undergraduate and MBA student members manage the three funds under the supervision of the group's faculty advisor. The fact that this year's achievement is part of a consistent trend makes it that much sweeter. The UOIG portfolio's performance has been above the median every year since the group began participating in the DADCO program in 2000. What's the secret to UOIG's ongoing success? According to the group's current advisor, assistant professor of finance Stephen McKeon, members benefit from the continuity the group provides. Associate professor of finance was the group's faculty advisor during the previous academic year, through which the DADCO investment period spanned. After the portfolio was rebalanced this September, the group received a check for $10,804.12 from D.A. Davidson, representing half of the portfolio's gains beyond 5 percent.